The story of Francis Yorpoi and the Gbakie family is just one illustration of trajectories permanently altered. Whether a crisis involves an epidemic, a natural disaster, or is man-made (ie. civil war, genocide) the tendency of global media and relief agencies has been to follow a cause until the immediate crisis is averted, but to quickly move on to the next crisis or news cycle as soon as possible. Yet while the world's media outlets and support networks are quick to respond to an emerging crisis, little is known about the degree to which individual lives, families, and communities are affected in the ensuing years, after the rest of the world has moved on. With these images I hope to take a small step towards shedding light on the trajectory of human lives in the aftermath of a catastrophe, in the hope that these stories will perhaps influence global awareness and the distibution of care to reach beyond the apex of a crisis to also include the more subtle yet equally vital path to recovery. November 2015. 12 year old Francis Yorpoi stands in front of his classroom at the We Yone school in the community of George Brook, in Freetown, Sierra Leone. 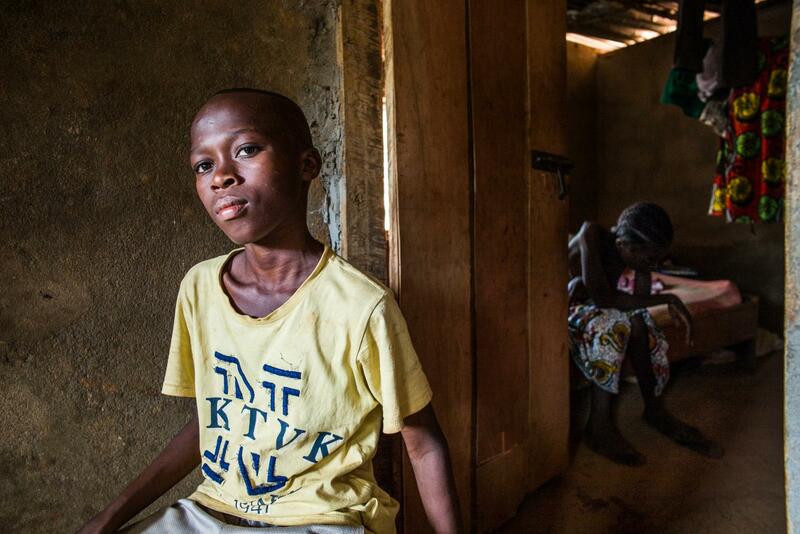 After the death of his parents, Francis was forced to leave the private school he had attended for most of his life. His uncle informed him school was not an option due to expense, and there were no free public schools in their area. 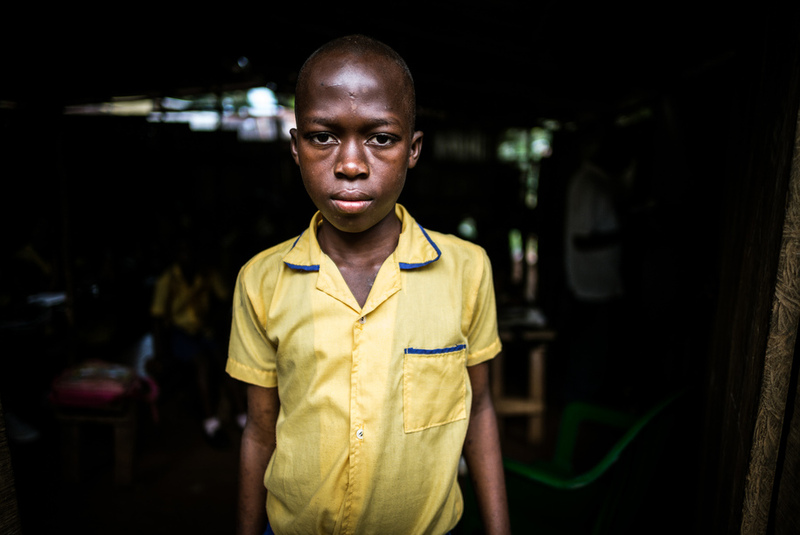 However, Francis found the non-profit We Yone school near his new home, and proceeded to show up daily for weeks begging to become a student. He was accepted and given a scholarship in late 2015. 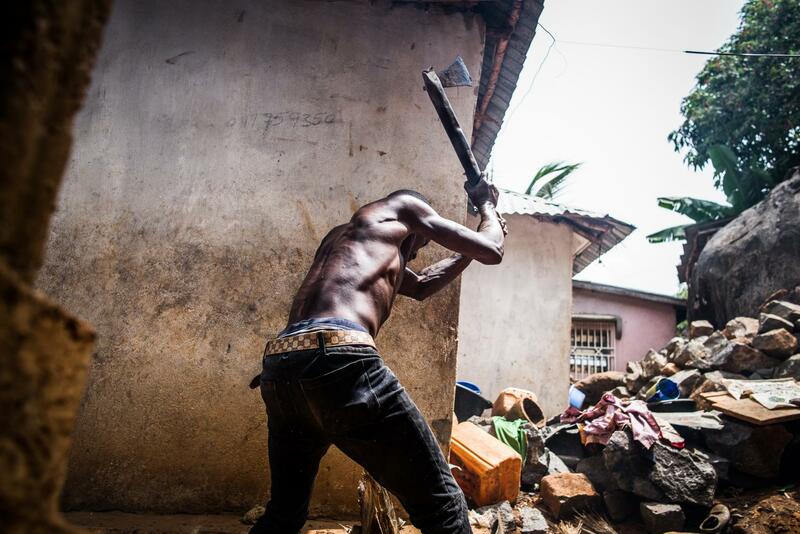 With it's insidious onset in May of 2014, the Ebola epidemic proceeded to ravage Sierra Leone for nearly 2 years, leading to the deaths of nearly 4000 people. In December 2014, Francis Yorpoi lost both parents--his mother, a homemaker, and his father, a photographer--within 2 weeks of eachother. He was adopted by his paternal uncle, Matthew Gbakie, and his wife Eye. The Gbakie family already had 3 sons of their own, and were also supporting the family's grandmother, Nidia. Even before Francis' arrival, they lived hand to mouth and Matthew was struggling to find work in the depressed economy. With the arrival of Francis and another mouth to feed, things didn't get easier. 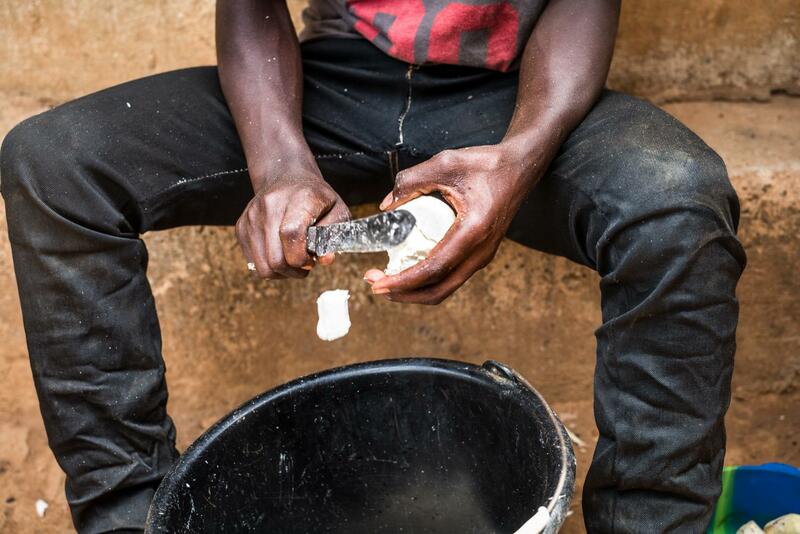 These images, taken in November of 2015 and April of 2017, follow the Gbakie family's trajectory over the course of the 2 years immediately following the Ebola epidemic. Through the Gbakie family, we can experience firsthand the altered trajectories of individuals, families and communities after a crisis has abated and the world has moved on. April 2017. Francis at home. Francis' school attendance these days has become sporadic. 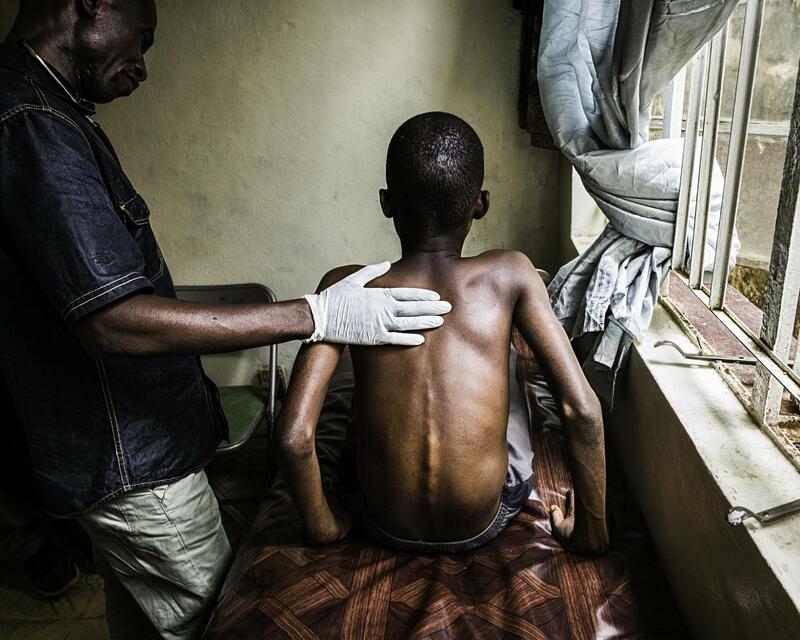 He suffers from malnutrition and recurrent bouts of malaria and typhoid, which are only partially treated, as the family cannot afford his medical care. 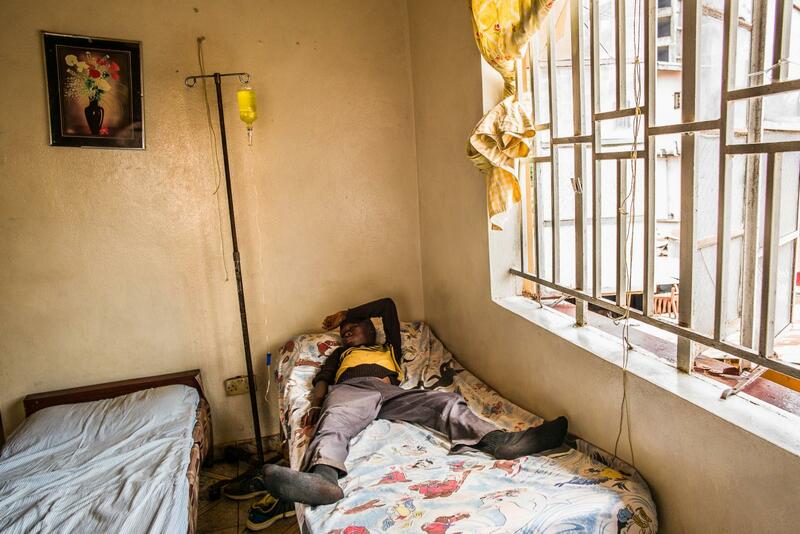 On the rare occasion when he does receive a full course of medications that are paid for and provided by the school, his uncle will instead give the meds to his ailing wife Eye, seen in the background here, who has been gradually weakening over the past year with an unknown illness. November 2015. A portrait of Francis with his uncle Matthew and aunt Eye in front of their home. April 2017. A portrait of Francis with his uncle Matthew and aunt Eye in front of their home. In the intervening months, Eye has gradually weakened with an unknown illness. November 2015. 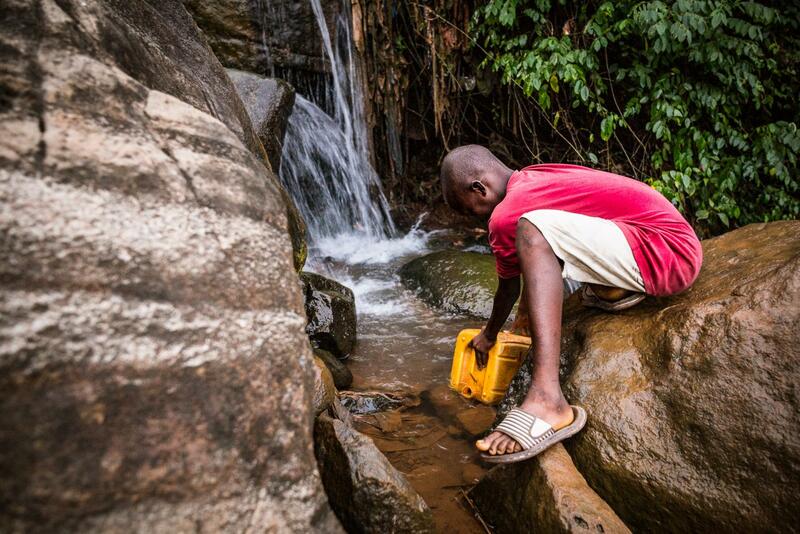 In the pre-dawn hour, Francis fetches water from the stream behind the family's home. This will be used throughout the day for bathing, boiling rice, washing dishes and clothes, and drinking water. April 2017. 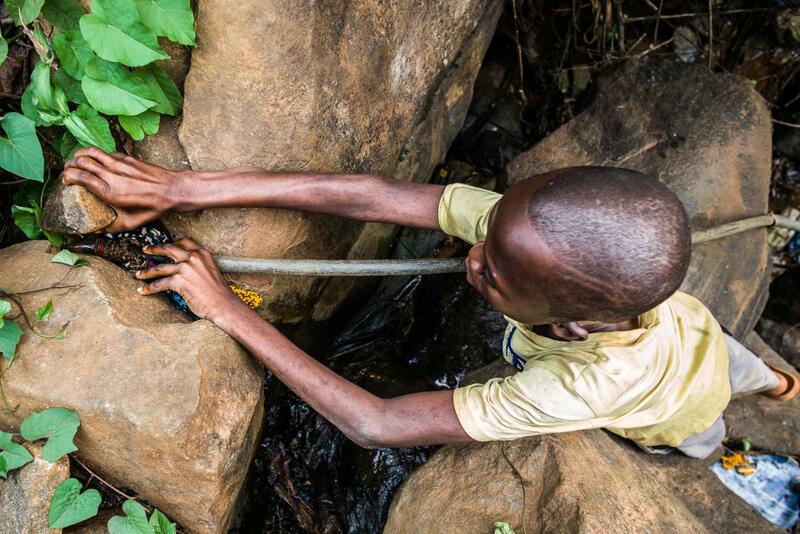 Francis fetches water at the same stream behind his home. 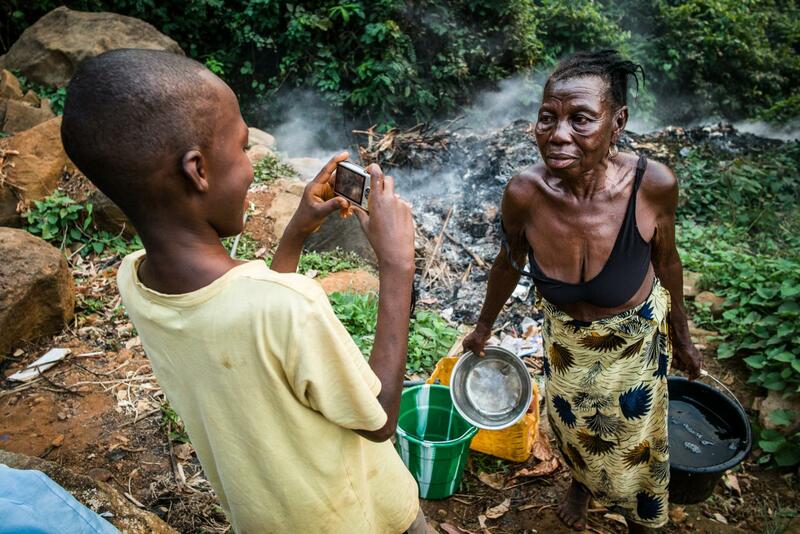 Now, the stream is invisible to the naked eye, and Francis and his grandmother Nidia have fashioned a series of discarded plastic hoses into a collecting system to siphon water from a tiny hidden pool of water that has collected along what was once a roaring stream. April 2017. 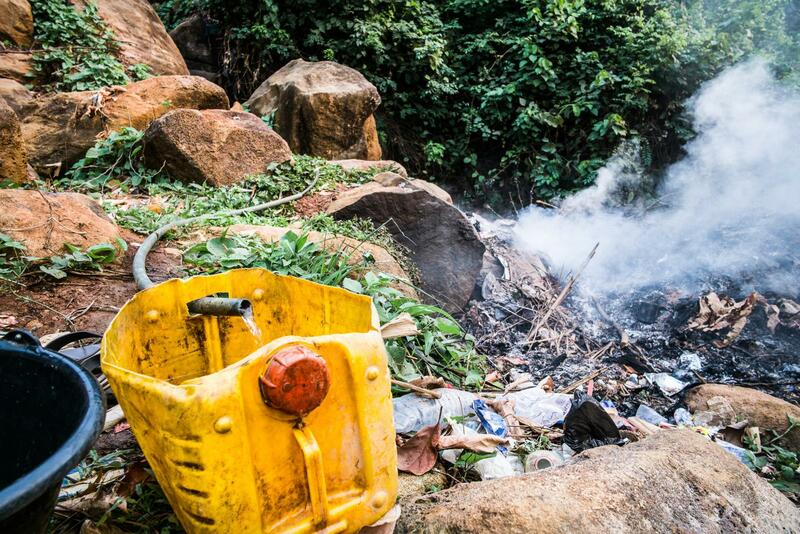 In the intervening months since 2015, a neighborhood dump has materialized at the stream's edge behind the Gbakie home. Here, the plastic hoses placed by Francis and his grandmother Nidia slowly fill the family's water container. November 2015. 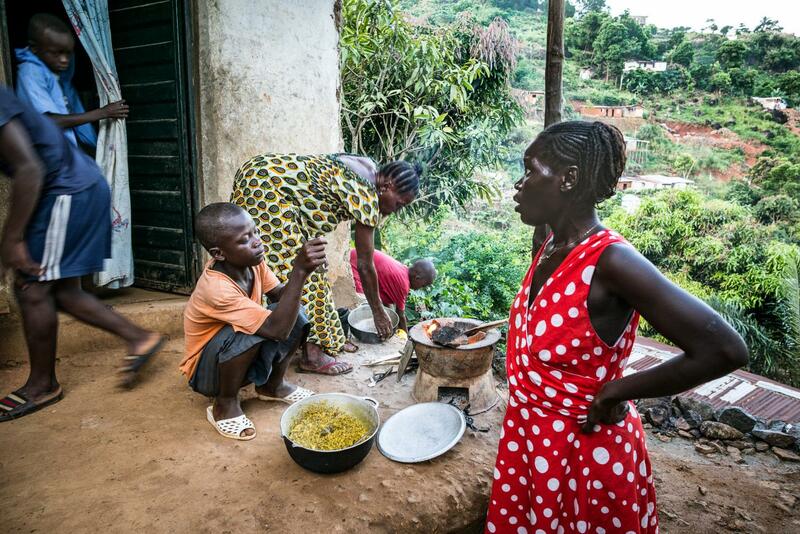 Eye and her husband Matthew, Francis' aunt & uncle, prepare the morning meal while their sons and Francis prepare to go to school. November 2015. Francis and his 3 cousins Earnest, Wilfred, and Michael eat breakfast before school on the front porch of their home. This is more often than not their only meal of the day. November 2015. Eye presides over the flurry of daily activities on the family's front porch. 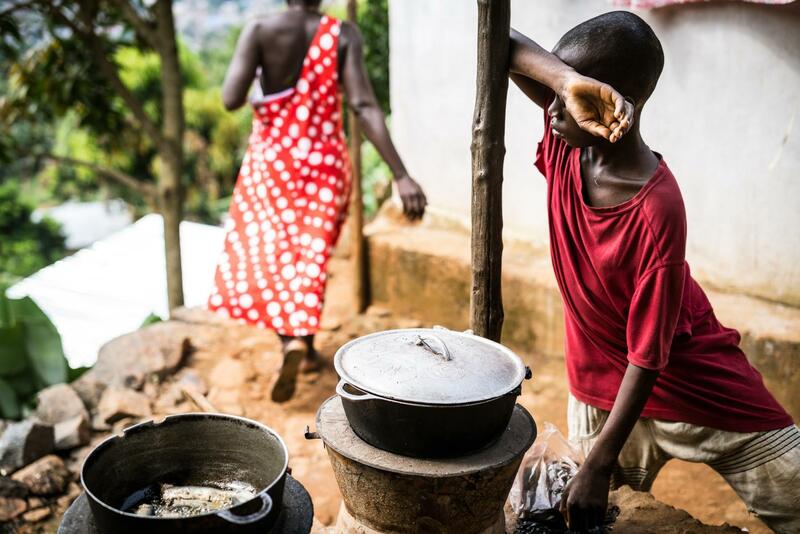 Whether it's cooking, ensuring that the boys are prepared for school, cleaning, chores, or the door to door commerce around which the community's micro-economy revolves, Eye is in charge. April 2017. Eye's son Earnest tries to coax his mother to eat. Weakened by illness, Eye is no longer strong enough to prepare meals. She has been unable to eat the standard rice meal for the past several weeks, due to a combination of difficulty swallowing, an unpleasant taste in her mouth, and the pain in her stomach with every ingestion of food. April 2017. The task of meal preparation has now fallen to the men in the family. 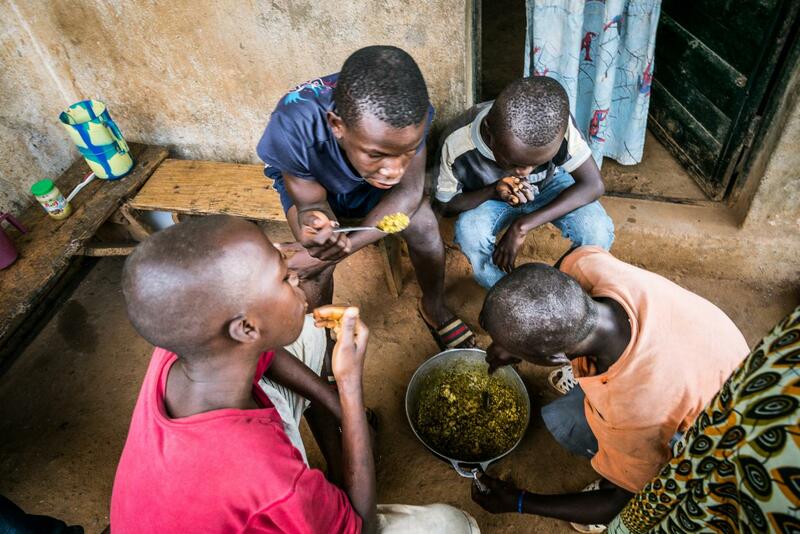 Here, Wilfred, Michael and Eye's middle son, chops cassava root for a meal. November 2015. Francis takes in a scolding from his aunt Eye after bringing home the wrong change from an errand to buy fish for the evening meal. April 2017. 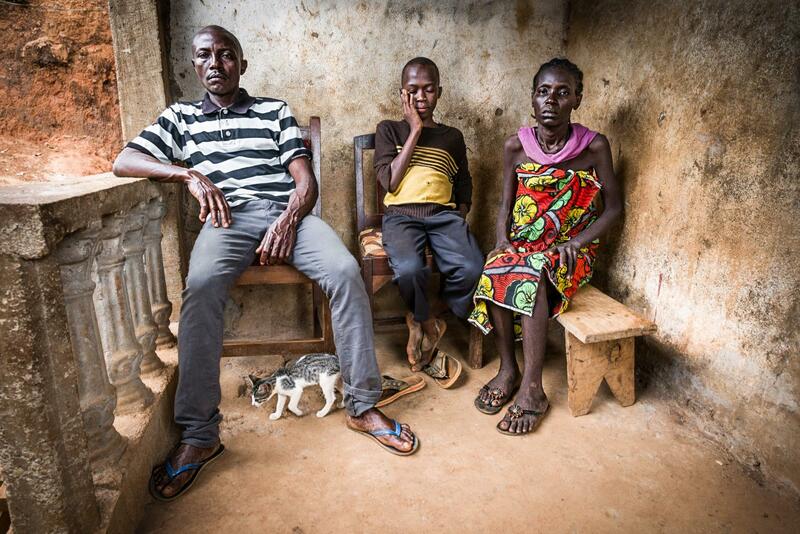 Earnest, the eldest son of Matthew and Eye, sits with his parents on the family's front porch. A hub of family activity in 2015, the porch has evolved into something more static. Family members are loathe to leave Eye alone, as she needs help with even the smallest of activities, including sitting and standing. April 2017. Matthew looks on as his wife Eye tries to eat. 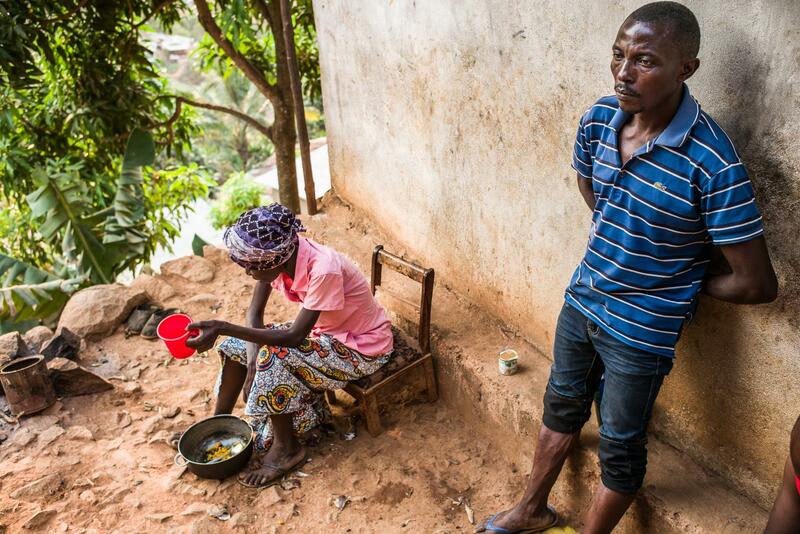 Matthew lost his job during the economic downturn at the height of the Ebola crisis in early 2015, and has been unable to find stable employment since then. 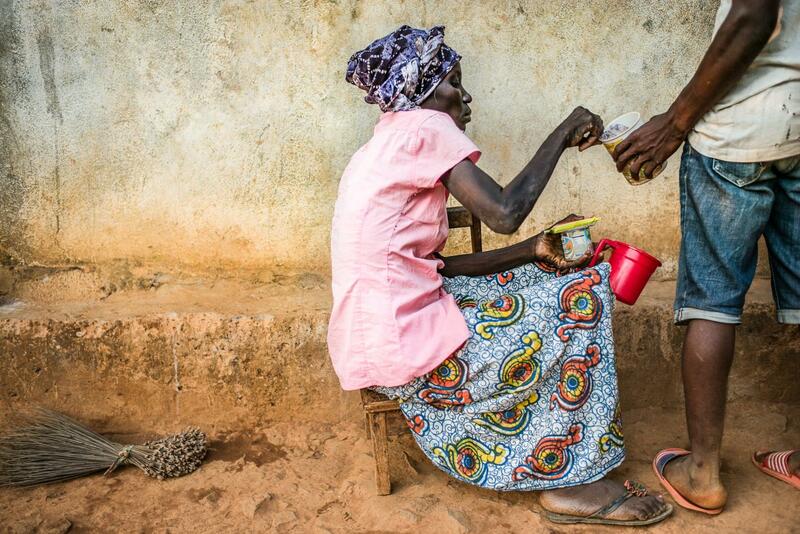 Now, his wife Eye begs him not to leave the home, as she is unable to care for herself without assistance. This leaves Michael with a dearth of solutions, as without work he is unable to earn the money necessary for her care, but leaving the home even for the small odd job leaves her without the care she needs day to day. April 2017. 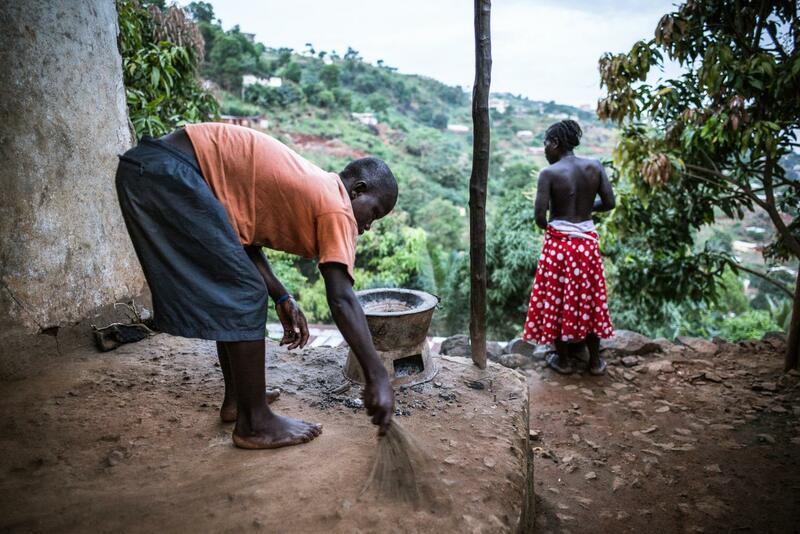 Matthew Gbakie immerses himself in household chores to pass the time, here chopping wood to make kindling to use for cooking the evening meal. April 2017. Nidia Gbakie. 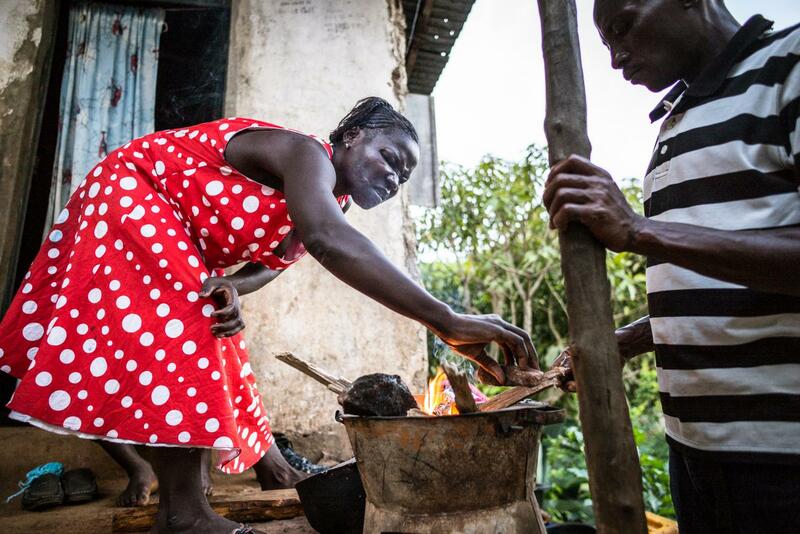 With her son Matthew confined to home taking care of his wife Eye, Nidia, the Gbakie family matriarch, has become the family's sole wage-earner, growing potatoes and onions behind their home and selling the produce to neighbors. 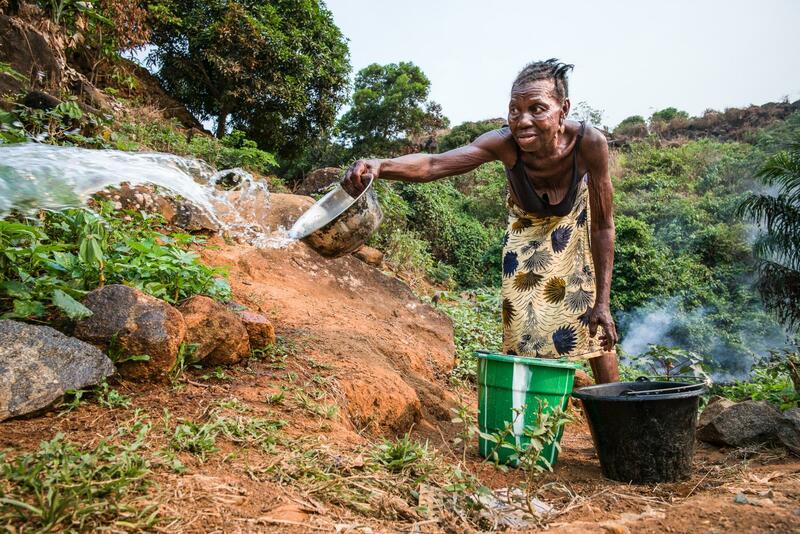 Here, Nidia waters the garden after coaxing water from what's left of the stream nearby, carrying over a dozen gallons of water daily up the hill to her garden from the water source below. November 2015. Michael Gbakie. 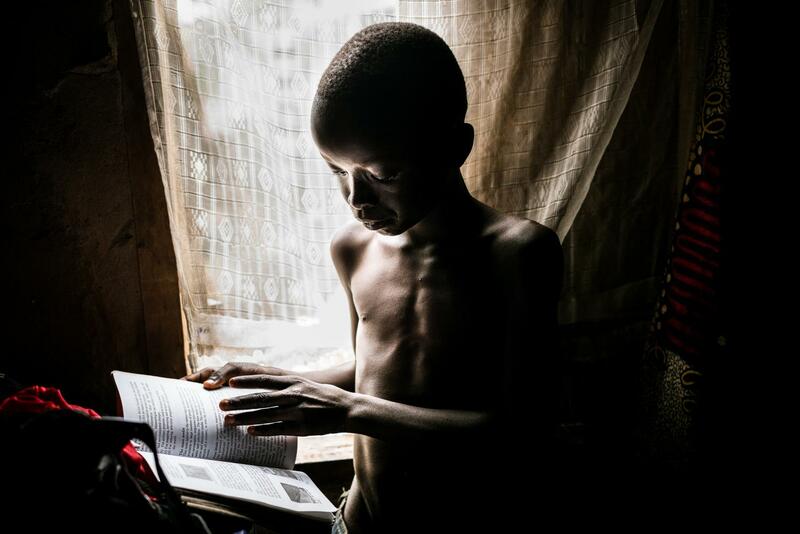 Michael, Eye and Matthew's youngest son, pores over a school textbook belonging to his older brother in his parents' room, the only room in the home with a window, and thus the only source of light for homework during the day. 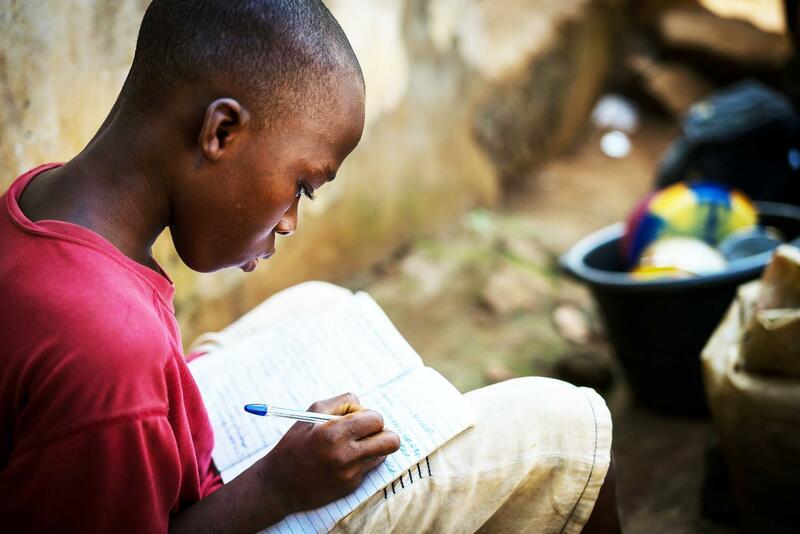 Michael has not yet learned to read, but is very invested in school, and excited to reach the level of literacy his older brother has attained. April 2017. Michael Gbakie. Michael chooses to spend most of his free time by his mother's side at home these days, and his attendance at school has dropped relative to 2 years ago. He has not yet learned to read. November 2015. 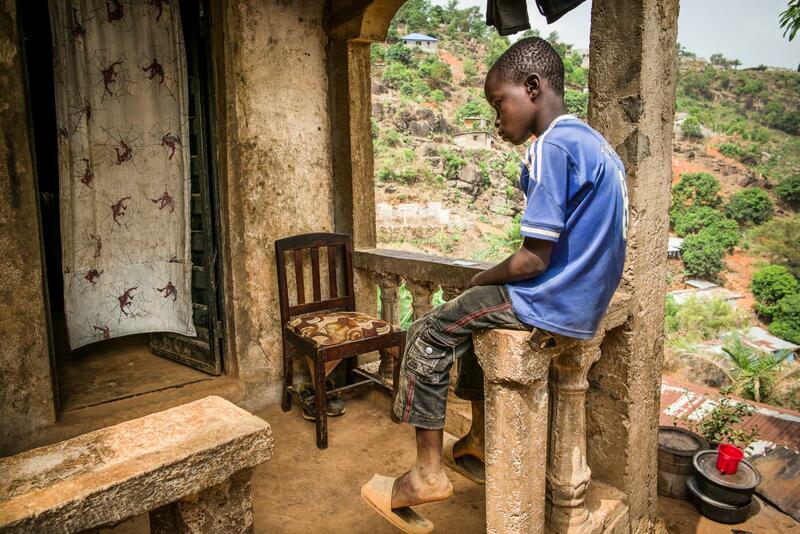 Earnest, the eldest son of Matthew and Eye Gbakie, sweeps the front porch, while Eye takes a moment to seek some relief from the painful residue of a shingles rash a few months earlier. While she has been healthy overall, she recently contracted shingles in the days before giving birth to a 4th son, during the height of the Ebola crisis months earlier. The infant soon became ill, and with the family unable to afford medical care and fearful of exposure to Ebola in the local clinics, the newborn child passed away at home. For Eye, while the rash itself has resolved, the searing pain of the inflamed nerve endings where the rash broke out remains--even the slightest contact with the involved skin on her chest & back is extremely painful, and she frequently steps away to lower her dress in search of a temporary reprieve from the otherwise unremitting discomfort. April 2017. Eye Gbakie tries to find a comfortable position on the front porch. At this point, in spite of her profound weakness and fatigue, she is only able to lie down for about 30 minutes at a time before being overcome by shortness of breath and chest pain. 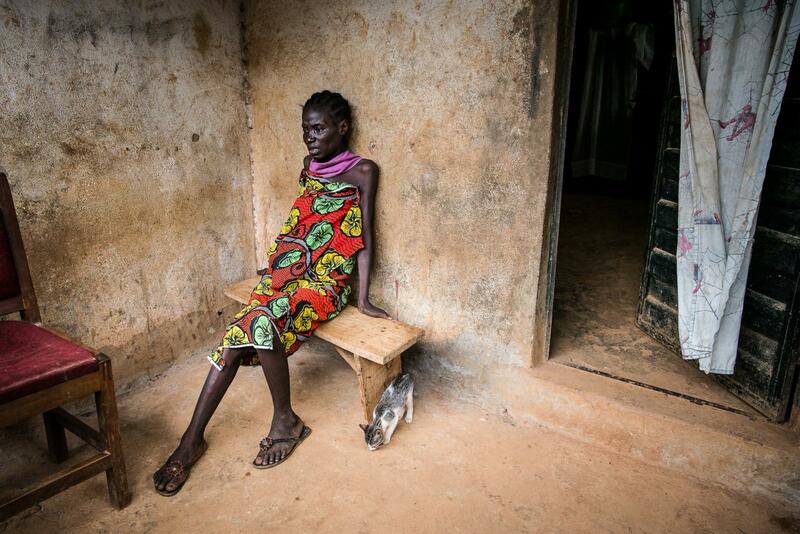 However, she is so exhausted, malnourished and weak that sitting upright presents its own unpleasant challenges. April 2017. 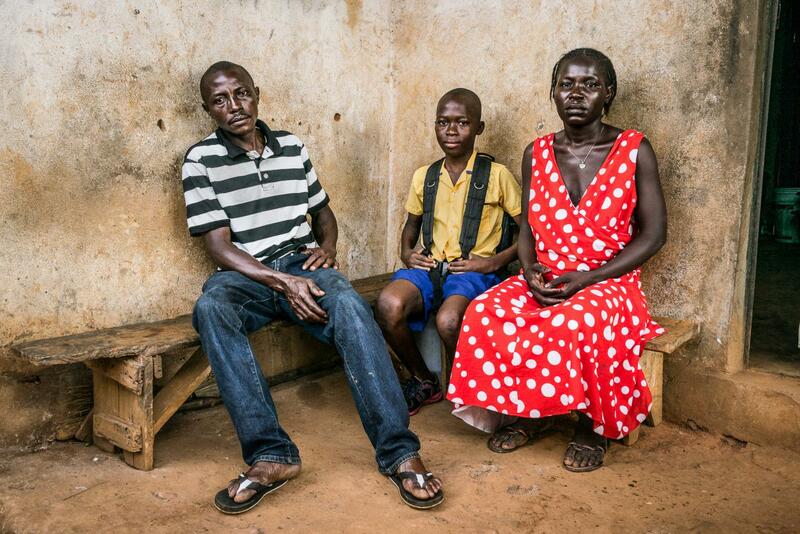 Eye Gbakie rests her head on her husband Michael's lap, exhausted and in pain after a rare visit to the doctor. For this particular visit, Matthew had saved up money for weeks, to get a chest xray that had been recommended by the local clinic. 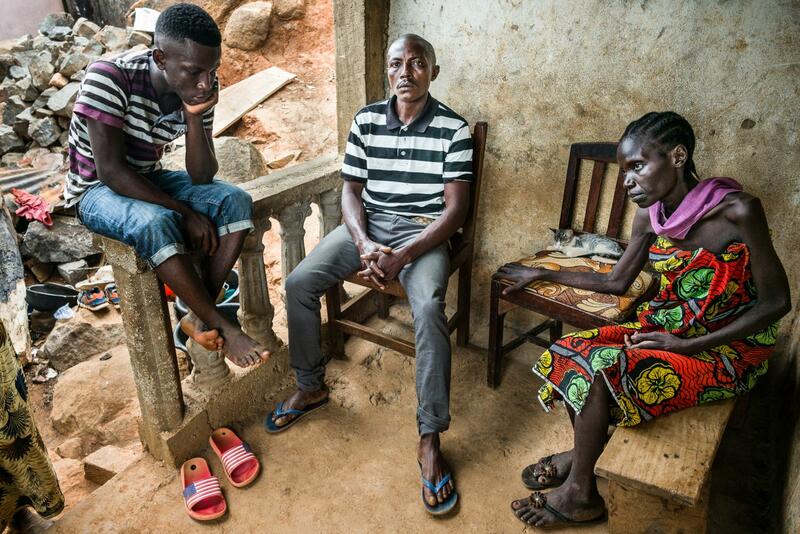 After carrying his wife down the mountainside into Freetown, Michael and Eye were informed that the xray machine was broken, and they would need to come back on a different day to have the study done. November 2015. 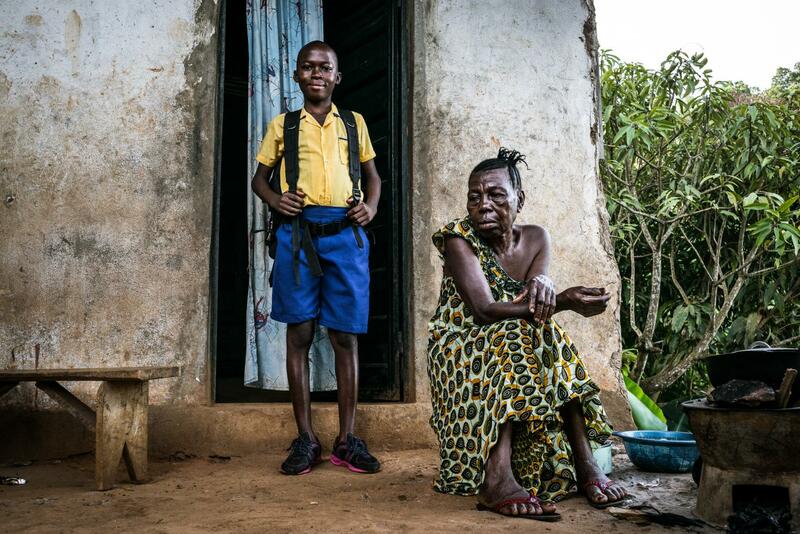 Francis poses in front of his home with his grandmother Nidia as he prepares to walk to school. After being admitted to a local charitable school, he's become a stellar student, and extremely hardworking by report of his teachers. When asked what he's most proud of, his answer is immediate--his good grades. November 2015. Due to the absence of light inside the home, Francis must do his homework outside, in an alley behind the dwelling. Using an overturned bucket as his chair, he does about 1-2 hours of homework here daily. April 2017. Francis presents to the Al Farouk medical clinic with fevers, shaking chills, vomiting, weakness, and loss of appetite. Here, he is evaluated by a medical technician. April 2017. Francis receives an IV infusion of anti-malarials, broad-spectrum antibiotics, and multivitamins. The clinic visit, including the above treatment, cost about $8 USD, which is more than Francis' adoptive family earns in a month. April 2017. Francis departs the Al Farouk clinic, after receiving medical care. 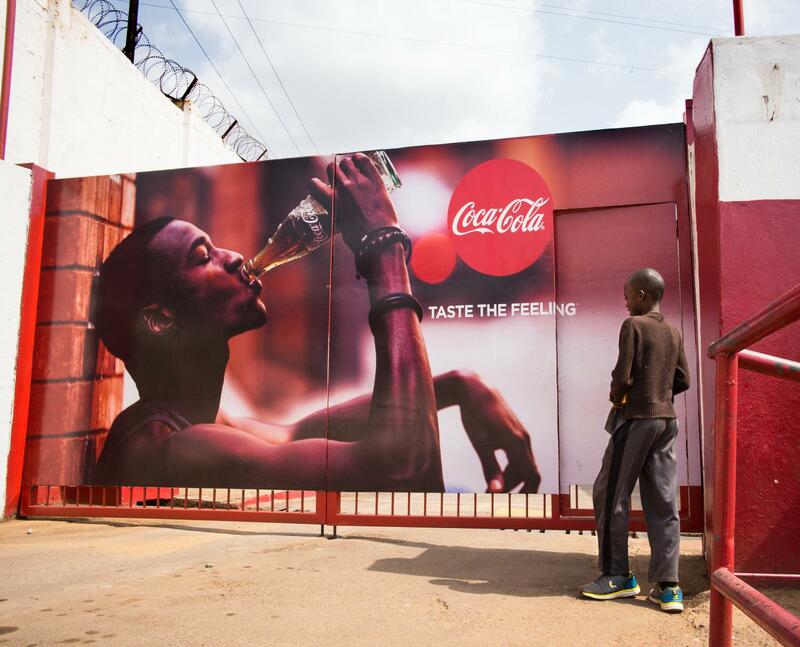 The clinic is adjacent to the Coca-Cola bottling factory in the George Brook neighborhood of Freetown, a major source of employment for the local population. April 2017. 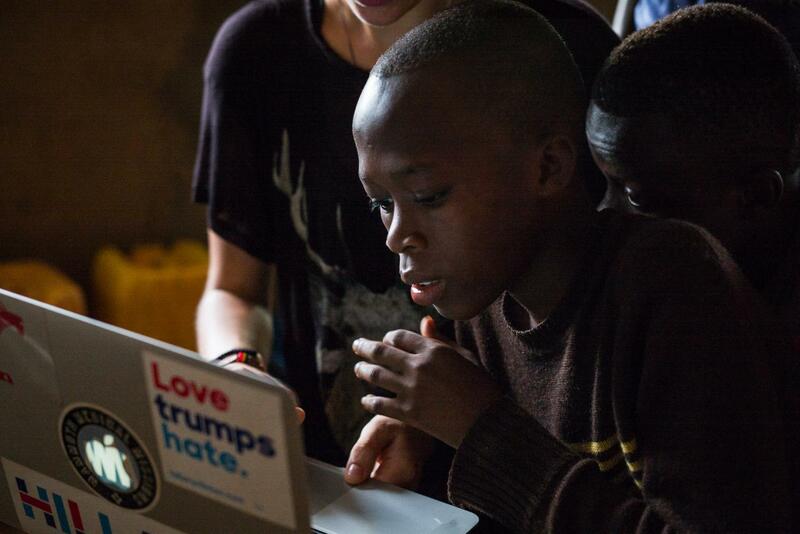 634 photographs later, Francis dives into his first-ever photo-editing session. Here, volunteer Emma Dugdale with the We Yone Child Foundation has come to Francis' home and walks him through the art of "less is more." April 2017. 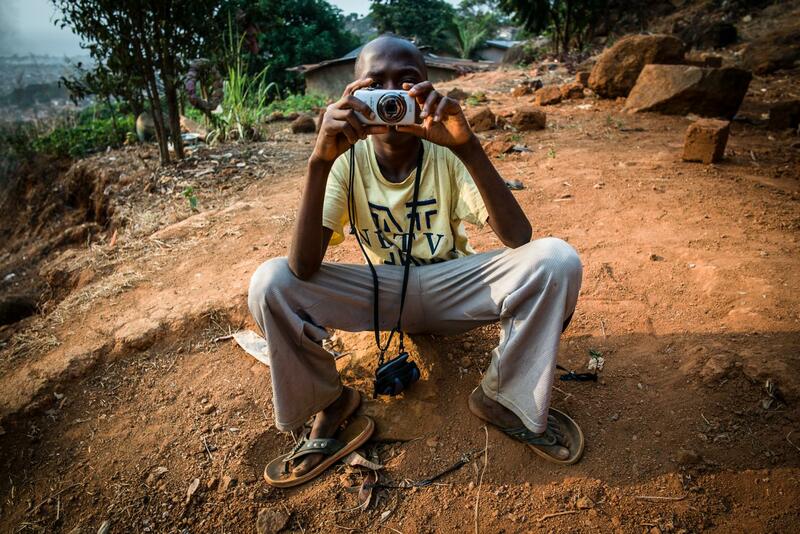 Francis Yorpoi, photographer, behind his home in the George Brook neighborhood of Freetown, Sierra Leone.